She would have looked lovely if the pants were longer. Now they look just odd. Yes, a rare mistake for her. Are those mirrors in the heels of her shoes? I think she can wear it, as slim as she is! Especially with high heels the trousers look good on her. Coralie, I agree. She looks great! Especially she can wear those pants, she looks good! The pants look too short and the blouse sleeves look too long. Not a good look. I like very much this trousers. A very flattering model for Letizia with that length and the bow belt. Not well fitting trousers - she's too small for them. 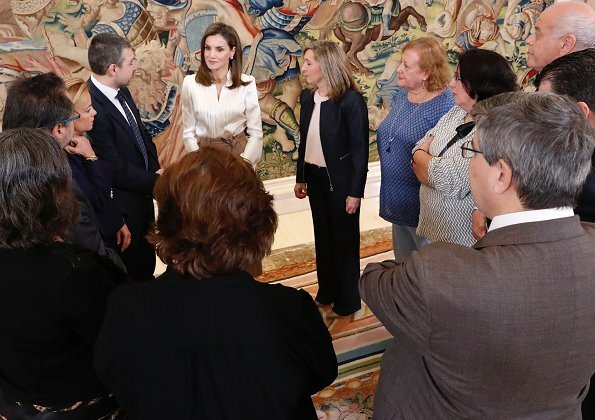 Letizia NO es pequeña. 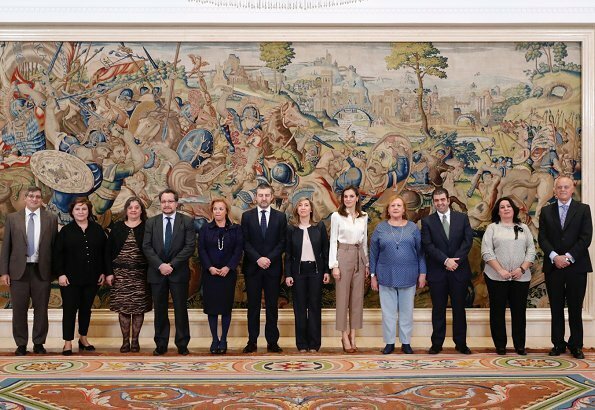 Observe la foto de grupo. Lovely top - a very flattering cut which I would wear happily. That looks bad. I almost shuddered at the sight of the third photo, because until then I had assumed the trousers were normal length, with a straight leg. But this? No, no, no. Forever no. Cropped trousers will always be a casual item for me and cannot be styled to look formal. Therefore, they look silly in a business-style cut, and with heels. Also, I don´t like the two browns together, and the bare-feet-in-shoes look makes me cringe. Sorry Letizia. Better luck next time. As they say in France, à chacun son goût. I don't see nothing to make one shudder or cringe in Queen L's look. On the contrary, I love the cropped pants and she looks lovely and perfectly dressed for a meeting like this one, where all the attending lady guests are very informally dressed. Too much formality on the queen's part would have been quite out of place and made their guests feel ill at ease. You must have always in mind, that dress codes differ from country to country, and here in Spain most people prefer to look toned down than overdressed. Wearing your emeralds, gloves, and a big hat for a visit to a food market, as Queen Máxima did a few days ago, would have been thought here highly ridiculous. I have always hated short pants. I will be glad when they are not popular anymore. 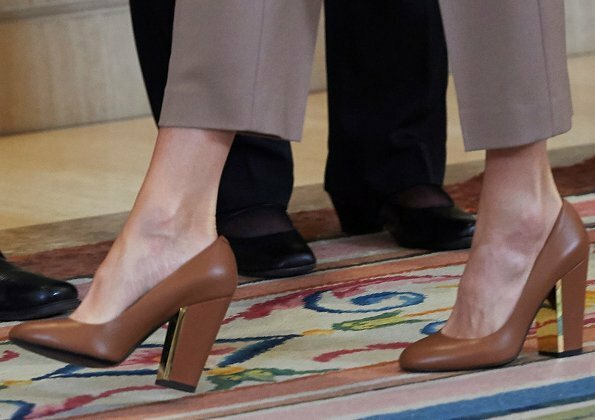 If the pants had been five or six inches longer Letizia would have looked stunning! What a shame! La reina está preciosa con esos pantalones tan originales y la blusa tan femenina. Como siempre, moderna y chic. Lettis kurze Hosen sorgen für eine modische Perspektive. Keeping an open mind is essential in fashion, otherwise we all would still look like Doris Day. And that makes ME shudder. The pants look too long to really be crops and too short to be ankle pants. I agree that they look odd. Absolutely amazing huge tapestry behind them all in last photo!!!! !